How Did Glitter Get These Environmental Protesters Charged With Staging A Bioterrorism Hoax? This story first appeared on Mother Jones and is reproduced here as part of the Climate Desk collaboration. It's not uncommon for environmental protesters to face arrest, but here's an apparent first: On Friday, Oklahoma City police charged a pair of environmental activists with staging a "terrorism hoax" after they unfurled a pair of banners covered in glitter—a substance local cops considered evidence of a faux biochemical assault. Stefan Warner and Moriah Stephenson, members of the environmental group Great Plains Tar Sands Resistance, were part of a group of about a dozen activists demonstrating at Devon Tower, the headquarters of fossil fuel giant Devon Energy. They activists were protesting the company's use of fracking, its role in mining of Canada's tar sands, and its ties to TransCanada, the energy company planning to construct the Keystone XL pipeline. 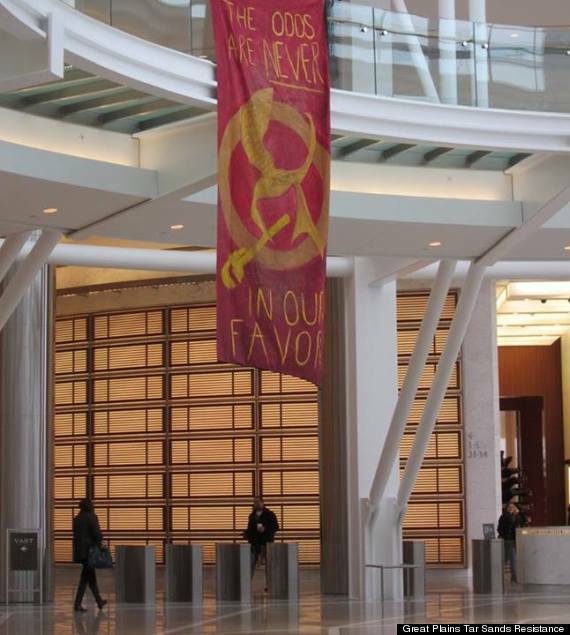 As other activists blocked the building's revolving door, Warner and Stephenson hung two banners—one a cranberry-colored sheet emblazoned with The Hunger Games "mockingjay" symbol and the words "The odds are never in our favor" in gold letters—from the second floor of the Devon Tower's atrium. Police who responded to the scene arrested Warner and Stephenson along with two other protesters. But while their fellow activists were arrested for trespassing, Warner and Stephenson were hit with additional charges of staging a fake bioterrorism attack. It's an unusually harsh charge to levy against nuisance protestors. In Oklahoma, a conviction for a "terrorist hoax" carries a prison sentence of up to 10 years. Oklahoma City police spokesman Captain Dexter Nelson tells Mother Jones that Devon Tower security officers worried that the "unknown substance" falling from the two banners might be toxic because of "the covert way [the protesters] presented themselves…A lot were dressed as somewhat transient-looking individuals. Some were wearing all black," he says. "Inside the banners was a lot of black powder substance, later determined to be glitter." In their report, Nelson says, police who responded to the scene described it as a "biochemical assault." "Even the FBI responded," he adds. A spokesman for Devon Energy declined to comment. Doug Parr, an attorney for the activists arrested on Friday, says he's never seen "terrorism hoax" charges—defined as "the willful conduct to simulate an act of terrorism"—filed against activists. "I've represented any number of political activists in Oklahoma for 35 years," he says. "This is the first time I am aware of that anyone has been arrested on terrorism-related charges for protest activity." Parr adds, "In my humble opinion, this is not at all an appropriate use of this statute." Parr thinks the charges are the result of TransCanada's recent efforts to pressure law enforcement officers in the South and Midwest to charge nonviolent environmental protesters with terrorism-related offenses. In June, activists publicized TransCanada PowerPoint presentations delivered to law enforcement officials that encouraged them to arrest Keystone XL protesters on terrorism charges. One presentation suggested law enforcement officers contact district attorneys for "information regarding the applicability of state or federal anti-terrorism laws prohibiting sabotage or terroristic acts against critical infrastructures" when dealing with nonviolent protesters, or working with a FBI field office. The environmental protest group Bold Nebraska obtained the briefings through an open-records request to the Nebraska State Patrol. After the presentations were made public, a TransCanada spokesman defended them by citing disruptive landowner demonstrations along the pipeline's proposed route in Oklahoma and Texas. TransCanada prepared one presentation, dated April 2012, specifically for the FBI. Parr says Oklahoma City police seemed determined on Friday to arrest the Devon protesters on terrorism-related charges. He says he overheard an officer at the scene, Major Steve McCool, ask for guidance by phone on how to charge Warner and Stephenson under Oklahoma's anti-terrorism act. Nelson says McCool would have consulted with the city or district attorney to determine the charges. "Who they contacted, I wouldn't know," he says. A TransCanada spokesman referred a request for comment to the Oklahoma City police. Warner, who has been arrested at protests in the past, sees his latest arrest as part of a pattern of increasingly aggressive tactics by law enforcement against environmental protesters. "It's scary," says Warner. "These companies want to make it seem like they're benevolent neighbors and no harm comes from their activities…To do that, they're trying to criminalize dissent."